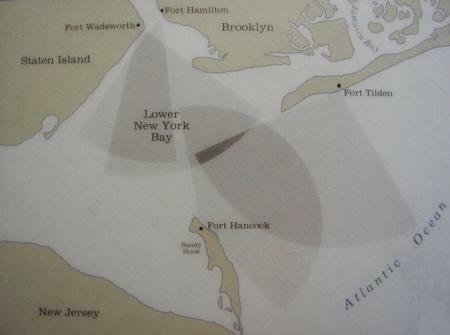 Fort Hamilton is located at the entrance to the Verrazano Narrows, overlooking Lower New York Bay; and out of all the other Forts mentioned here, Fort Hamilton is the only one still active (albeit as headquarters to several commands, not as an artillery base). Fort Hamilton was organized in 1825, with completion in 1831, and was another Coastal Defense installation. Several famous American military personnel were stationed here, those being: Captain Robert E. Lee; who would serve as post engineer 1841-1846, and Thomas "Stonewall" Jackson, and Abner Doubleday who would be Post Commander in 1861. Like the other military installations mentioned having locomotives here, nothing can be found regarding a railway on the premises. Referencing the 1921 series of Fort Maps fails to show any recognizable notations regarding the use of a railway. Yet once again; one can only hypothesize about the use of a railway in the Fort: it in all likelihood had built to haul munitions from bunkers to the artillery batteries. Also, H. K Porter records show this locomotive was delivered "care of G. W. Kuehule, assistant engineer, Fort Hamilton".